The Community Safety Checking Map shows dangerous and attractive areas in the town you are living. All of the information was found by local residents when they were walking around the town and was summarized as a map. 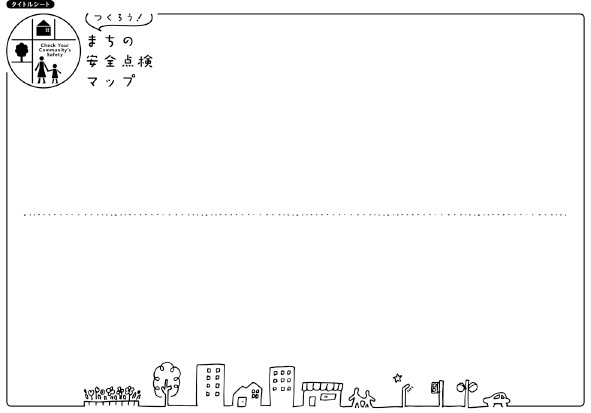 Making a map gives you the chance to rediscover the town that you live in. The aim of making a map is to encourage the residents to take action to make the town better. 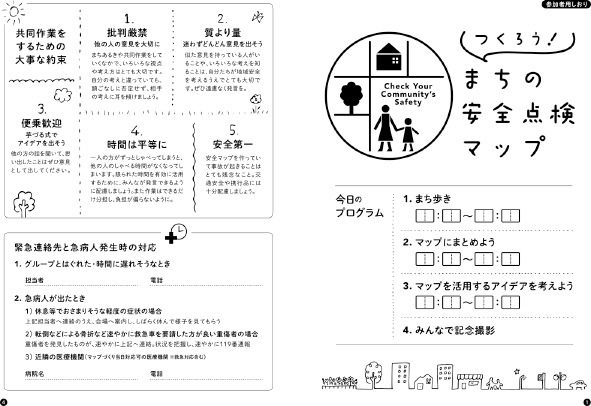 The tool is available for general use such as making a safety map through walking around the town. In addition, it can be easily used for map inspection. The tool, has plenty of illustrations, and is designed so that people can work on making a map with familiarity. The colorful seals and cards can entertain participants and are also suitable for children and foreigners who cannot read. It contains the time schedule of the day, how to proceed, what to prepare, division of roles, and notes for group activity. The illustration seals to put on the map are meant to show points found through walking. While walking through the town, you can put seals on whatever you notice without taking notes. Seals also show checkpoints at a glance. Discovery seals can be used for environment beautification, traffic safety, things related to crime, visibilities or disaster prevention. Depending on the theme of walking, they are available for a combined use as well. 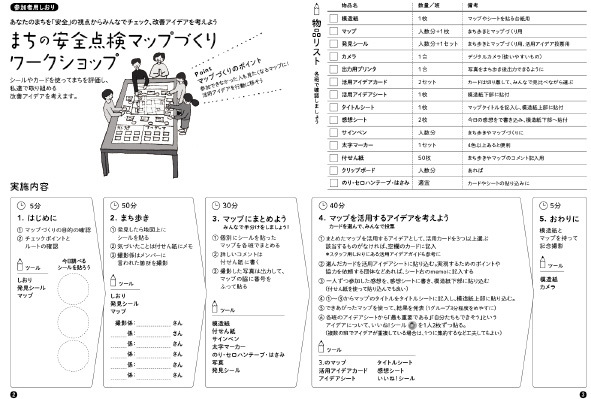 The sheets and cards are for discussion about what to do next by making use of a summarized map. The cards are illustrations showing various attempts that were found suitable for the region to implement through the map making. The illustrations can be used as examples of improvement and make it easy for adults and children to consider ideas for improvement. 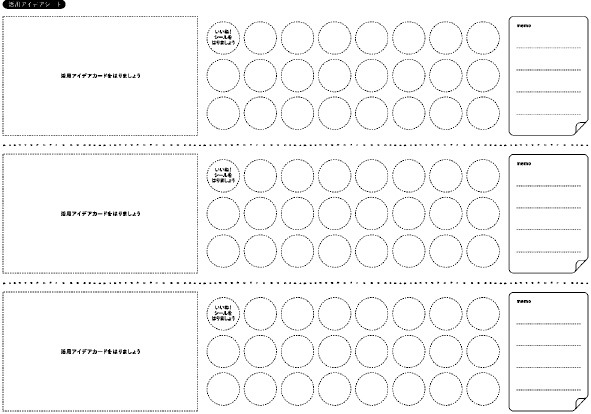 The sheet to put the chosen cards on has sections to write down specific ideas and to vote seals for further consideration. The seal vote creates a chance to reconsider the safety of the town for not only participants who joined map making, but also residents through the vote. To make titles and write down thoughts are the key points of group work like map making, however they are apt to be left undone. 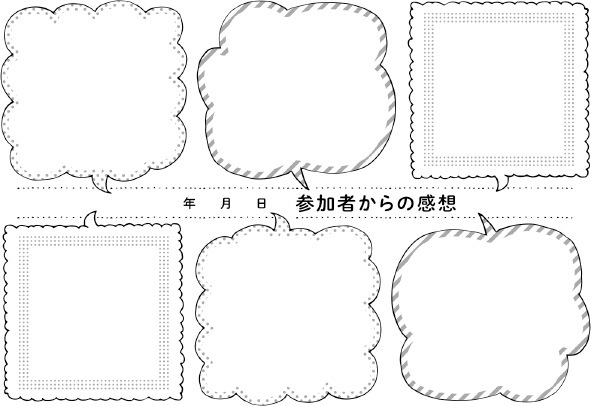 We made the sheet to write titles and thoughts with pleasant design, so you can enjoy filling in the sheet. It is a hard work for the PTA and residents’ associations where members change annually to plan and prepare the neighborhood inspection from nothing every time they need the inspection. As a result, we often see the same examples that they spent a day to make the map and could not find the time to discuss the problems they found through the map making. Also, the map they made is rich in originality for people who took part in the making process, but it is hard to read for people who do not join the map making. It ends up an unfortunate waste. In order to use the map that participants put an effort to make for improvement of the town, we prepare template, seal, sheet and card so that we can save as much labor as possible. (1) Example of town inspection and map making by kids, PTA, teachers and local adults. 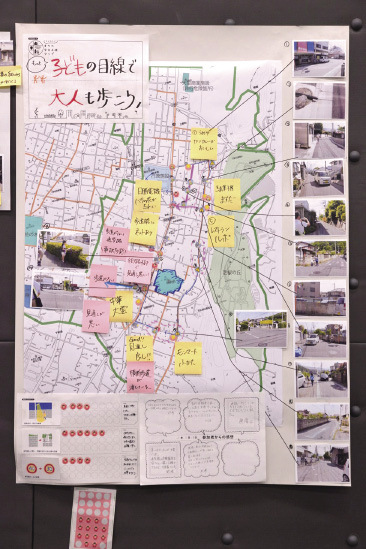 In Chichibu City, the town inspection was conducted targeting the area under the Chichibu Dai 2 junior high school’s district that includes two elementary schools’ districts. Students and PTA from elementary schools, officers and senior residents got together to do the town inspection from various points of the view. When adults and children work together on making the map with limited time, adults tend to take the lead in most of the process. However, each necessary process to make the map can be done with the tool, so it enables people to divide roles smoothly. When considering ideas, all members joined the discussion scattering cards around. ◎If we had the map enlarging streets we walk, it would make it easier to put seals on clearly. ◎It was really good making the map, and I want to take the advantage of the experience from now on. At the advance meeting of the case (1), in order to examine the walking route for the day among the main members of the community like council officers, teachers and PTA members, they use the Discovery seals on the map to check dangerous and attractive spots. The use of Discovery seals brought good results. For example, each discovery stands out clearly at first sight, the regional characteristics are recognized quickly and the decision of the route for the day was smoothly made. (3) Example of reviewing the activity of walking through the town for the better use of the map making. 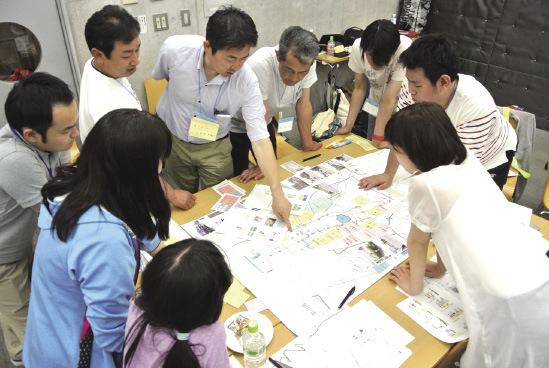 Sakonyama housing complex in Yokohama City Asahi Ward runs UR Sakonyama Living Workshop to implement projects such as “Designing the Community Safety Checking Map Project”. 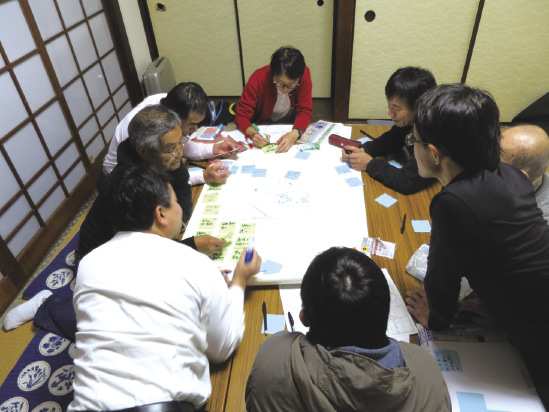 Members from Father Group “Oyaji-no-kai” take the leadership to run the project and walk through the town for map making with the motto of pleasant walking. 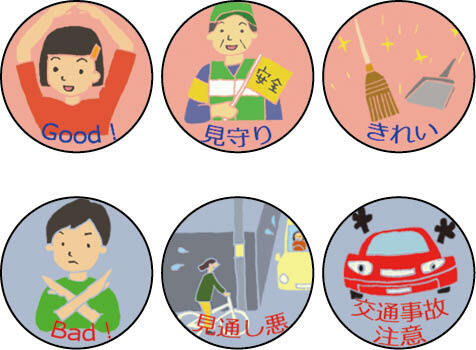 They take part in the project with the concept of walking together around our own town with fun, because the safety for the town sounds too formal. If they finish the activity only with walking, there are no records left and the activity ends with only their own satisfaction. By reviewing the walk with a map, seals and tools, they can do the map making with ease. Also, putting on seals that show various points of the view made them realize new attractive parts of the town. They also had opinions about dangerous areas. Members from Fathers group “Oyaji-no-kai”, grown up in Sakonyama and usually too busy with work to walk around the town, had no end of topics to talk about places and scenery where they used to play when they were kids. The result shows the possibility that the map making can apply for the investigation of children’s play and places by adding seals regarding disaster prevention and playgrounds. Next approach is to keep reviewing activities of walking through the town so that we can make a basic material to learn how we should summarize a map and how we should use the map in the community.